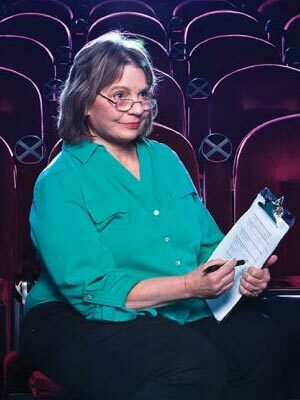 Patricia Owen, Ph.D., poses in a San Antonio movie theater. It’s the kind of happy ending that makes Patricia Owen, Ph.D., shake her head. The 1998 blockbuster “A Beautiful Mind,” starring Russell Crowe, depicts a brilliant mathematician obsessed with his work who mentally deteriorates to the point of hallucinations and paranoia. After being hospitalized for schizophrenia, his personal and professional life crumbles until willpower and the support of his devoted wife help him return to academic prominence. To Owen, a clinical psychologist and chair of the Psychology Department, it’s a romanticized portrayal of the very serious mental illness schizophrenia. And she has seen enough schizophrenia cases to know that they seldom end like a Hollywood fairy tale. “I just think, ‘Wait a minute. This is a beautiful film, but it has all of these distortions’,” she said. It’s certainly not the only movie to distort schizophrenia in order to create a compelling story. Owen has spent the past several years trying to understand how schizophrenia is portrayed in contemporary motion pictures and the effect it has on public perception of the illness. Her conclusion? “Misinformation breeds stigmatization,” she said. When Owen tried to find films realistically depicting schizophrenia that she could show in her abnormal psychology courses, she was hard-pressed to find any. Even more unsettling was the fact that, when surveyed, many of her own students were confused about what schizophrenia actually is; many incorrectly believed it was the same as multiple-personality disorder, or Dissociative Identity Disorder. It was enough to make Owen forgo the soda and popcorn for a pencil and coding sheet. Owen analyzed 72 movies made between 1990 and 2010, identifying 42 characters that met criteria mandated by the Diagnostic and Statistical Manual for Mental Disorders for a diagnosis of schizophrenia. She assessed the prevailing symptoms and treatments portrayed by the characters and determined that many were embellished or misconstrued. More often than not, the films depicted characters with schizophrenia in an unflattering light — movies like “Donnie Darko” and “Shutter Island” have helped fuel the perception of a correlation between schizophrenics and homicidal maniacs. In actuality, past research has indicated that patients with schizophrenia are more likely to be the victims of violence rather than the perpetrators, Owen said. Schizophrenics are also often introverted and susceptible to depression, two traits that “A Beautiful Mind” did capture. Seldom, though, do they achieve the levels of professional success that John Nash (both the character and the real one) did, and his genius knack for mathematics is largely to thank. The movie also suggests love can cure such mental illness, but don’t count on it — there is no known cure. Movies are clearly for entertainment, but Owen maintains they are also a source of information. And when that information is distorted for entertainment purposes at the expense of a demographic, it can lead to negative stereotypes. Owen has always felt a deep-seated connection to patients with the illness. During the years she worked for different psychological hospitals, Owen got to know many patients on a personal level and has even invited a few to speak in her psychology classes. If diagnosed early, psychotropic medications along with a proper support system, usually family or an outpatient treatment facility, can enable patients to lead a mostly functional life. Untreated, schizophrenia is debilitating — patients are typically unable to maintain jobs or hold meaningful relationships. Those who cannot afford medication frequently turn to drugs or alcohol and, in many cases, end up homeless. Owens acknowledged that further studies will need to be conducted to determine methods to correct stereotypes and misconceptions. Until then, Owen accepts the responsibility of teaching others that people with schizophrenia are not to be feared. However, as long as mental illness is associated with horror films, Owen said there will continue to be an “us versus them” mentality among the public. She believes filmmakers should become more aware of the power they have to shift negative perceptions. “I think Hollywood directors need to be more concerned with the message they are portraying,” Owen said.